New Guinea impatiens, known botanically as Impatiens hawkeri, are a species of flowering annuals that have a long bloom period from spring through fall. 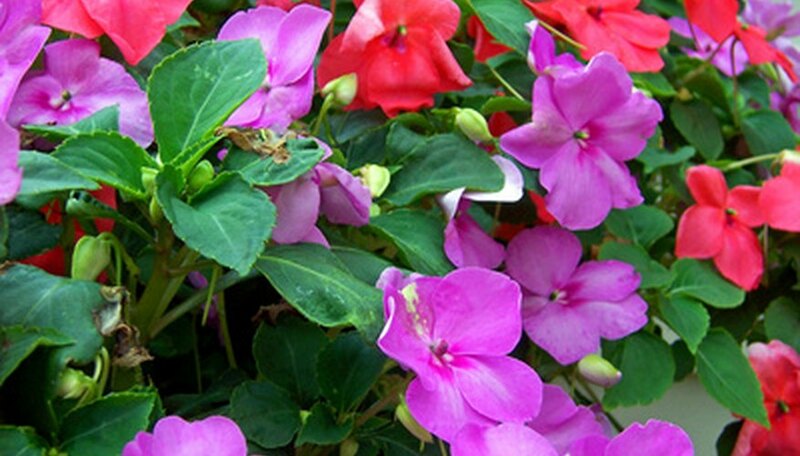 Impatiens are highly sensitive to drought and environmental stress, quickly wilting or dropping leaves, buds and flowers that can make it look like the plant is dying. Triage care can save struggling impatiens plants and set them on the road to recovery. Rapid and ample irrigation, light feeding and removal of dead or diseased tissues will all help to reduce stress and reinvigorate the plants. Water your New Guinea impatiens immediately if the soil is even slightly dry to the touch. Keep the soil very moist, but not soaking wet, at all times thereafter. Never allow the soil to dry out, even temporarily, beyond the top 1/8-inch crust. In summer, warm climates or when grown in containers, daily watering of impatiens may be required to keep them alive. Fertilize your impatiens with a water-soluble complete 10-10-10 fertilizer for flowering plants, immediately when you notice them struggling. Apply fertilizer over moist soil and water in well immediately after feeding. Apply according to the label dosing directions and repeat once per month, from spring through fall, thereafter. Remove dead and decaying plant tissues immediately to reduce stress on the plant and prevent the spread of disease. Remove spent flower heads and dead or discolored leaves and stems. Pinch the compromised tissues between your fingernail and thumb or trim off with a pair of small scissors. Remove all of the cuttings from the plant and the soil surface to prevent tissues from rotting on or near the plant where they can harbor disease. Mulch around the base of the plants, over clean soil, with a few inches of an organic material such as shredded bark or cocoa bean hulls. Mulch will hold the newly applied moisture in the soil and insulate the roots from heat and temperature fluctuations that can stress the plants further.